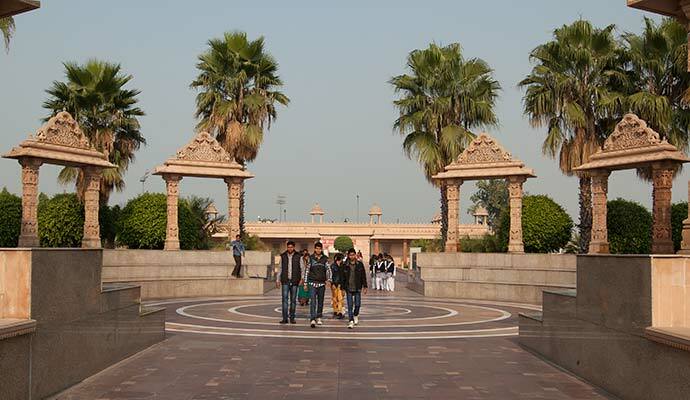 A pilgrimage at Akshardham begins at the Ten Gates – signifying ten directions – and continues as visitors pass through the Gate of Devotion, the Visitor Center and the Peacock Gate to arrive at the Charnarvind. Along the way, traditional Hindu symbols of positivity, devotion, beauty and purity create a divine ambience. Each visitor delves into the experience of Akshardham infused with the energy of this auspicious beginning. The ten gates symbolize the ten directions described in Indian culture. They reflect the sentiments of accepting all that is auspicious and good from every direction. Such openness of mind and heart fosters the spirit of universal love, brotherhood and peace in the world. 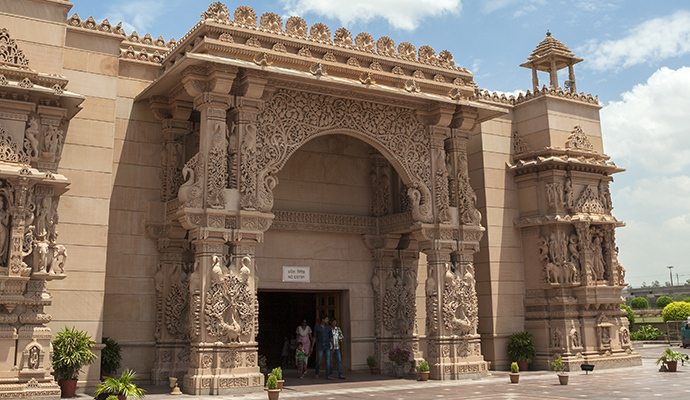 This ornate stone entrance symbolizes the offering of pristine bhakti – devotion – towards the dual forms of God and his devotee (Bhakta-Bhagwan). Devout Hindus offer their bhakti to Akshar-Purushottam, Lakshmi-Narayan, Sita-Ram, Radha-Krishna, Parvati-Shiv, Nar-Narayan and others. The Bhakti Dwar has 208 beautifully carved pairs of Bhakta-Bhagwan bestowing their blessings on all. 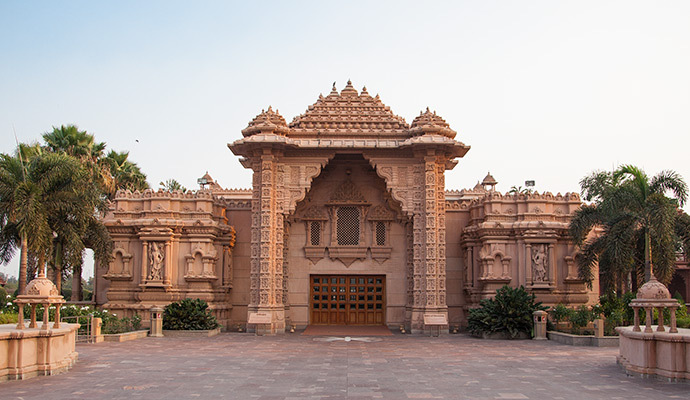 Through the Bhakti Dwar or Gate of Devotion, one enters Akshardham's Visitor Center. The Visitor Center greets everyone with a display of bells to welcome all that is good. 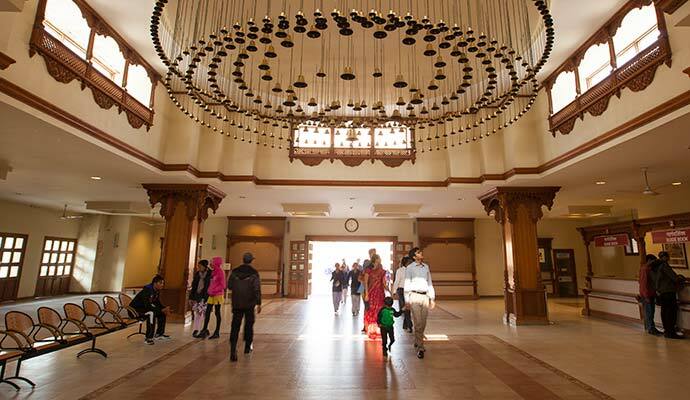 In the Visitor Center, one will find volunteers ready to assist in planning one's time at the Akshardham complex. Informative posters help introduce the complex and its different components. The peacock stands for beauty and self-control in Indian culture. It is the national bird of India and loved by people across the country. It is revered by virtue of its association with divine incarnations and stories in the Hindu shastras. Each of the two Mayur Dwars has 869 intricately carved stone peacocks welcoming visitors with their enchanting beauty and poise. 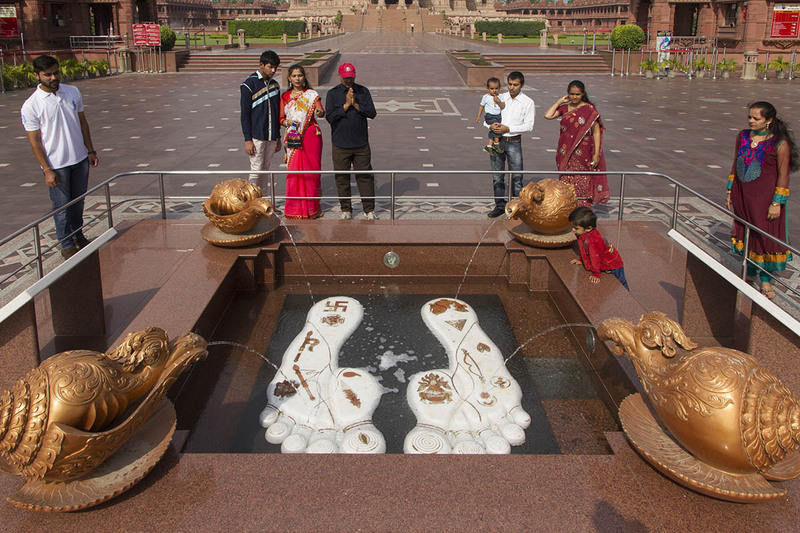 A large marble replica of the holy footprints, or 'charanarvind', of Bhagwan Swaminarayan (1781-1830 CE) between the two Mayur Dwars commemorate his incarnation on Earth. The sixteen holy symbols which mark God’s feet as per the Hindu shastras are seen in these holy footprints. In humble reverence to Bhagwan Swaminarayan, four conch shells shower water at his lotus feet.